Tensions run high as the leaders of Skaikru decide who will survive inside the bunker — or whether they will risk all their lives by fighting Octavia and the Grounder clans. Clarke and Bellamy attempt to rescue Raven before time runs out, but run into trouble on the road. 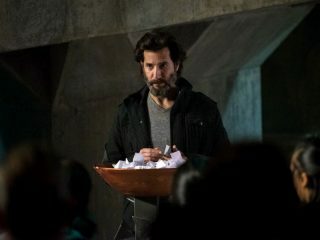 Jaha (Isaiah Washington) and Kane (Henry Ian Cusick) disagree over how to handle their grim reality. Meanwhile, Clarke (Eliza Taylor) leads a group to save a friend. Bob Morley, Paige Turco, Marie Avgeropoulos, Devon Bostick, Lindsey Morgan, Christopher Larkin, Richard Harmon, Zach McGowan also star. Alex Kalymnios directed the episode written by Aaron Ginsburg & Wade McIntrye (#412).